The Gowri-Ganesh festival has just passed for this year. Did you enjoy the modaks, kadubus, puran polis and the laddoos? 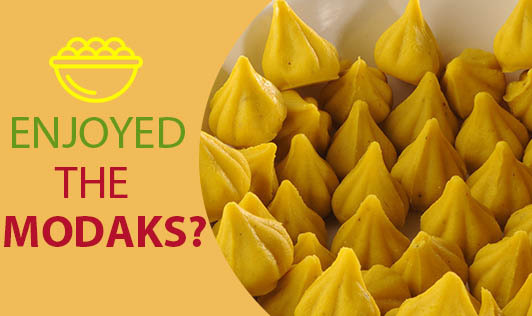 Modak is actually a healthy sweet dish if it's steamed. The shell of the modak is made of rice flour and the sweet filling is made of coconut and jaggery. The dumpling is either steamed or deep fried in oil. The steamed version is sometimes eaten with ghee. Modak is believed to be Lord Ganesh's favorite food and therefore has a special importance in the worship. If you have enjoyed the festival and eaten all the goodies over the weekend, good for you! Now it's time to get back to healthy foods and daily exercise.